In this article, we're going to take a look at how to use Sass and Compass in our WordPress theme development process. We will structure our theme stylesheets in SMACSS fashion and will leverage the power of Compass to generate image sprites for both retina and non-retina devices. Note that this article is not an introduction to Sass; however, if you are a beginner, still feel free to follow along. There are few GUI based Sass and Compass applications, but I will be using the Terminal (if you're on Windows, then you can use the Command Prompt). Feel free to use the tool with which you are most comfortable. Let's start by creating a folder for our project. 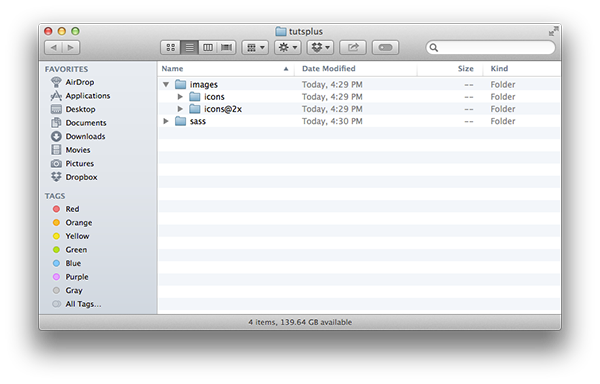 Create a new folder on your Desktop and call it tutsplus. Inside it create two new folders: sass and images. The sass folder will contain our Sass files that will form our theme stylesheet, the style.css. We will use Compass to watch for file changes inside the sass folder and, when a change occurs, it will use the Sass to compile our stylesheets. Every time we launch Compass, it will look for a configuration file in the current directory. That file is called config.rb. Chage the css_dir = "stylesheets" to: css_dir = "/". This will tell the Compass to output the generated CSS files inside our theme root folder, as this is where the WordPress will look for our theme's style.css. Set your prefered output style for the generated CSS. Here, I will set it to expanded style by typing on line 12 output_style = :expanded. Uncomment lines 14 and 17 by deleting the preceding hash symbol so that the following lines look like relative_assets = true and line_comments = false. All right! Now that we have the configuration file, it is the time to create our first Sass file. Create new file inside the sass folder and call it style.scss. 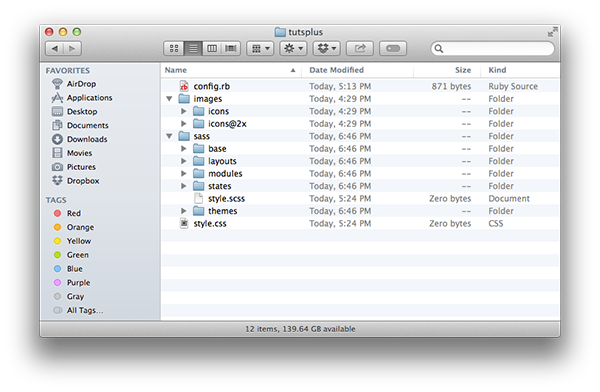 Next, launch your Terminal and navigate to the /Desktop/tutsplus/ directory. Execute the compass watch command. This command will start a process that will continuously look for Sass files changes inside our sass folder. It will find our style.scss file and output its CSS representation as style.css inside our tutsplus directory. Note that all files inside our sass folder that names does not start with underscore will be processed and outputed in the tutsplus folder. This is exactly what we want for the style.scss file. An important thing to remember: Don't make direct changes inside the generated CSS files, as your changes will be lost once you compile again your Sass files. We are going to separate our style.scss into small components using the style guides defined in SMACSS (Scalable and Modular Architecture for CSS). The author of SMACSS is Jonathan Snook and he has published a book about this very topic that I encourage you to read. If you are a Tuts+ member, you can download a copy of it from here. Let's create a folder for each of those categories inside our sass folder. Use the following names: base, layouts, modules, states and themes. In your base folder, put all of your stylesheets that conform to the SMACSS Base Style Rules. Those stylesheets should apply styles only on element selectors. This is also a good place to put your browser reset CSS. Compass comes with browser reset based on Eric Meyer's reset stylesheet. For this project, I'm going to use normalize.css. Download the normalize.css file and place it inside the base directory, then rename it to _normalize.scss. Make sure to change its file extension from css to scss. As you can see we are omitting the underscore in the file name and its file extension. The Sass preprocessor is smart enought to import the file we wanted. Here, place your theme layout styles. For example, this will include your header, sidebar, footer and page layouts as _header.scss, _sidebar.scss, _footer.scss and _page.scss. This is also a good place for your grid stylesheet. You can read more about SMACSS layout rules, as well. Modules are reusable content elements. For example, a blog post is a module in that its rules are re-used on multiple instances of same module. Widgets, shortcodes, and icons are also a type of module. Here we are using the BEM (Block Element Modifier) class naming convention. Place here your stylesheets that control the appearance of your elements depending on some state. If you are building a responsive theme place here your media queries stylesheet. Let's create one right now. If you have for example an off-screen navigation menu, here you can put the styles that will controll the appearance when your navigation .is-open or .is-closed, but in most cases you will put those in the layout or module file for the off-canvas navigation. This is a good place to put your custom WordPress plugin's styles. For example, here you can put your custom styles for, say, the Contact Form 7 plugin. Each WordPress theme's style.css file should contain meta information about the theme like theme name, author, version and more. We can take advantage of the Sass variables to change that information for each theme we create. First create a new file called _vars.scss and save it inside the sass folder. In this file we will put all of our variables. If you find that this file grows too big, separate its content to smaller files. Now if you open the processed style.css file it will contain the WordPress theme information comment block with the variables values that you set in _vars.scss file. It is a good practice to use more small more generic CSS classes to style an element rather than using one too specific selector. Follow the DRY - Don't Repeat Yourself principle. We can create a stylesheet for our small helper classes. To give you an example, I will define some layout and typography helpers. Create a new file called _helpers.scss and save it inside the sass folder. Again, as with the variables file, if your helper file get too big to maintain, consider splitting it into smaller files. Compass comes with handy methods for generating image sprites. We will place our icons inside our icons and icons@2x folders, where the latter will contain the same icons but in twice the size for devices with retina display. For this example, I will put inside two icon files: checkmark.png and star.png that you can find in the download package associated with this post. Compass will find all the *.png image files inside our icons folders and will generate two image sprites in the images folder. Now we want to generate CSS classes for those images. Both mixins are accepting an icon name plus a sprite map as arguments. Those mixins will set the width, height and the background position for the icon inside the generated image sprite. The retina_sprite_icon will also set the appropriate background size for the retina icons. Here, we are looping through our icon names list which is identified by $theme_icons and generating both retina and non retina style rules using our icon mixins. From there, we generate a class called .icon that will be the base module for our icons and then the module modifiers classes for each icon in the list. Sass and Compass are both powerful utilities and can go a long way in improving your WordPress theme development and WordPress plugin development. This guide aims to set you on the road to creating a more refined process for working with WordPress.